The Aikido Circle was founded in 1975 by Sensei Allen Beecham who began his Aikido career in 1966 studying extensively under Chiba Shihan. The Aikido Circle began teaching traditional Aikido in London. In 1984 the Aikido Circle joined an "umbrella group" which provided access to tuition by Tamura Shihan and the teachings of Saito Shihan. In 1989 Sensei Beecham "retired" from Aikido and Sensei Paul Barker, who has been practising Aikido for more than 45 years and Iaido for 40 years for, drawing inspiration from Tamura Shihan, Saito Shihan, Chiba Shihan, and Nishio Shihan took over as Chief Instructor. In 1993 the Aikido Circle became an independent Association again, with Dojos in Essex, and Sussex. What styles do we practice? 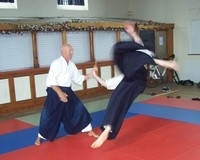 The style we practise is traditional Aikido, with emphasis placed on practical techniques and martial effectiveness. We continue to evolve and adapt our style to meet the needs of the modern world whilst remaining true to the tradition of the art, such additions to practise have included being able to defend yourself while seated. Within the Aikido Circle Weapons practice is treated just as important as the unarmed training and you will learn the relationship between the unarmed techniques and the relationship with the Ken (sword) and Jo (staff). The importance of weapons in day to day training and has led to the creation of an independent weapons syllabus has provided students with the opportunity to further develop their knowledge. Other aspects that are focused on in practise are the use of Atemi (striking) something that is neglected by most other Aikido clubs but is a fundamental part of the art as O’Sensei (the founder) has himself stated that Aikido in its purest form it Irimi (enter) and Atemi (strike). The Aikido Circle's traditional values remain as strongly today as they did in 1975 with particular attention to basic technique, discipline and etiquette. The core systems of Aikido that are taught within the Aikido Circle are Traditional Aikido and Iwama Ryu weapons as the Technical Aikido Basic System. We also practice a lot of Shoji Nishio Sensei's style of Aikido and his weapons extensively. Iaido is also heavily practiced and the system practised is Shoji Nishio Sensei's AIKI TOHO IAI which he has slightly modified in the Iai Nishio Sensei learned to fit in with Aikido Techniques. In addition, we also train in Iaido, which is the traditional Samurai art of drawing the sword in combat. A special one-hour class is held every Monday evening at the Sidley dojo from 7pm to 8pm.